If It's a Smart Car, Why Does It Look So Stupid? It’s 8 feet of automotive amusement wrapped around a rockin’ “3-cylinder, 1-liter gasoline powered engine.” OK, that’s only impressive if you like driving around in a golf-cart with sides or you find a riding mower cooler than a Maserati. Meet the only car that ought to come with a mandatory Mensa membership – the so-called Smart Car. It’s already the car of the present for micro Europeans, but if environmentalists have their way, it might be the kind of car that will be your future. There’s really only one problem – even this dorky motor scooter of a car doesn’t meet Barack Obama’s new mileage standards. The Smart Car and its equally ridiculous hybrid friends matter because they might be all that’s left on the roads after Democrats destroy what remains of the American automotive industry. That’s exactly what Obama’s trying to do. He wasn’t content with the firing General Motors CEO Rick Wagoner or with Chrysler’s bankruptcy. He’s certainly not content just throwing mountains of cash at the industry ($83 billion and counting, according to Time magazine). So he decided to clog the gears with new requirements for gas mileage. Under the new Obama-nation rules for mileage requirements, each carmaker will have to meet 35.5 mpg for its fleet. Cars will have to meet 39 mpg. That’s not an easy standard. Only two – the Toyota Prius and the Honda Civic Hybrid – meet that standard in 2009. 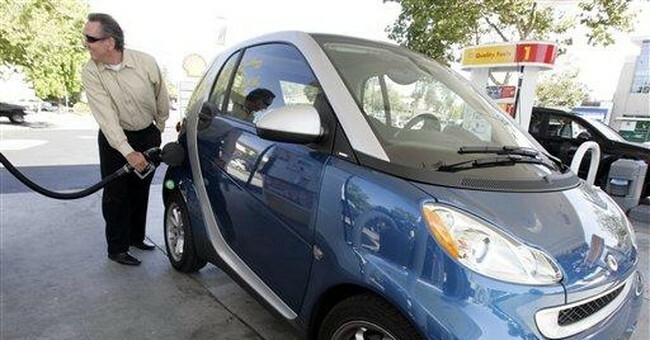 In other words, the Smart Car, which gets 36 mpg, falls 3 mpg short of the goal. Not so smart after all. A smarter car would have made sure that Obama bailed out its company as well so the president would mandate we buy it instead of hybrids. These kinds of mandates are definitely in our future. Obama increased the Corporate Average Fuel Economy (CAFE) standards for cars by 30 percent with a wave of his hand. But he can’t mandate the innovation necessary to make that happen without concessions to physics. American car companies will be forced to cut size, cut luxuries and make all-around worse cars to meet these draconian mandates. Left out of that equation are taxpayers who have to fund this atrocity and car buyers who will be fighting tooth and claw over the last decent cars left on used car lots. They’ll have to buy used because the new Obama rules will add $1,300 to the cost of each automobile. That seems an important point. But it’s buried, glossed-over or flat-out ignored by the news reporting because such facts are insignificant to network reporters. But it’s not insignificant if you want to buy a car. In the middle of a recession, our president is striving to make one of the most important purchases that much harder for working people. The Smart Fortwo car (you know it’s a lefty car because they spell it like e.e. cummings would as “smart fortwo”) costs $11,990 base. Tack on $1,300 and that’s almost an 11 percent increase. So much for making an inexpensive car that ordinary people can drive. Ultimately, this remains what NBC’s Brian Williams called a “truck and SUV nation.” The only way to change that is either making better small cars or by force of law. Obama and his lefty supporters don’t have a clue how to make cars, but they know enough about law to make you buy whatever they make.